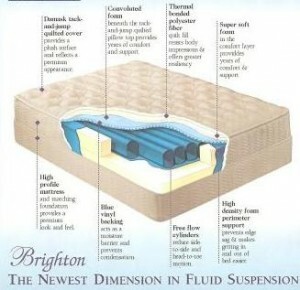 Waterbeds are here to stay and we carry a complete line of “Hardside” and “Softside” water mattresses. The softside mattress offers all the benefits of sleeping on water with the convience of a conventional mattress. If you’re a tried and true waterbed sleeper we have the wood framed waterbed system and mattresses from a full-motion to a 99% motionless version.